Historian J. William Lamb brings his years of research to chronicle the remarkable lives of 22 people who not only founded the church but were pioneers of Ontario. Here are bloody battles, personal accounts of their part in the American Revolutionary War, resettlement in Upper Canada, and faith discoveries. 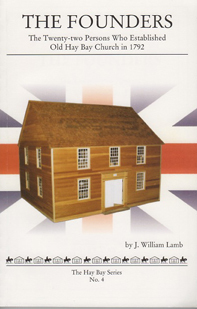 A publication by the trustees of Old Hay Bay Church, Canada's oldest extant Methodist church in the Loyalist Country of Lennox & Addington County. It was built in 1792, less than a decade after the arrival of the first Loyalists. Book produced by Wallbridge House Publishing.